The Lioness, from The Cyclopedia of Arts, Sciences and Literature, Longman, Hurst, Rees and Orme, 1807. 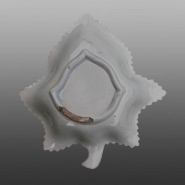 An earthenware pickle dish printed in blue in Adams' Lions pattern. The print on the pickle dish is made up of two prints of the lioness and her cubs. The full pattern seen on flatware also includes the lion. See the source print of the Lioness shown below. This pattern is believed to have been made by both William and Benjamin Adams.